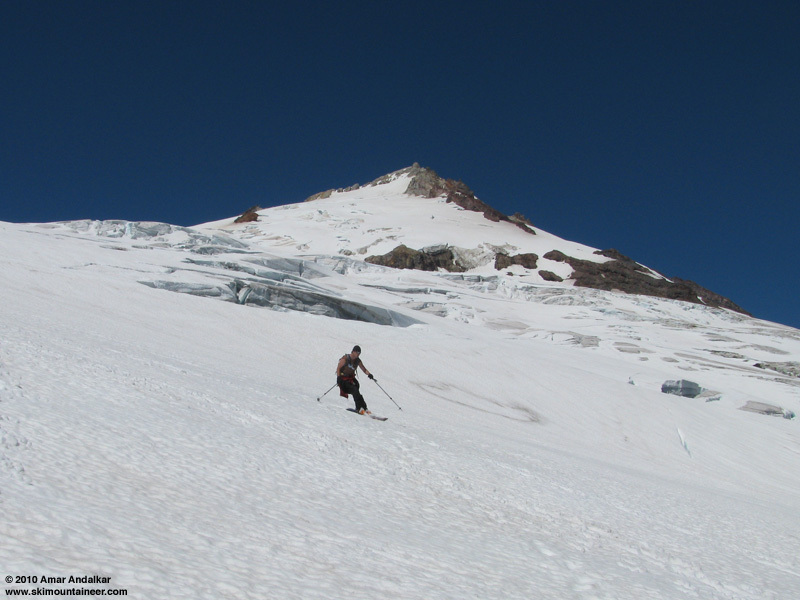 Well, I expected a bunch of other skiers to have been up here over the weekend, and for someone else to have written a trip report -- but I don't see any TRs yet, so here goes another . . . because it's still SO GOOD. The best ski conditions I have ever seen in mid-August. 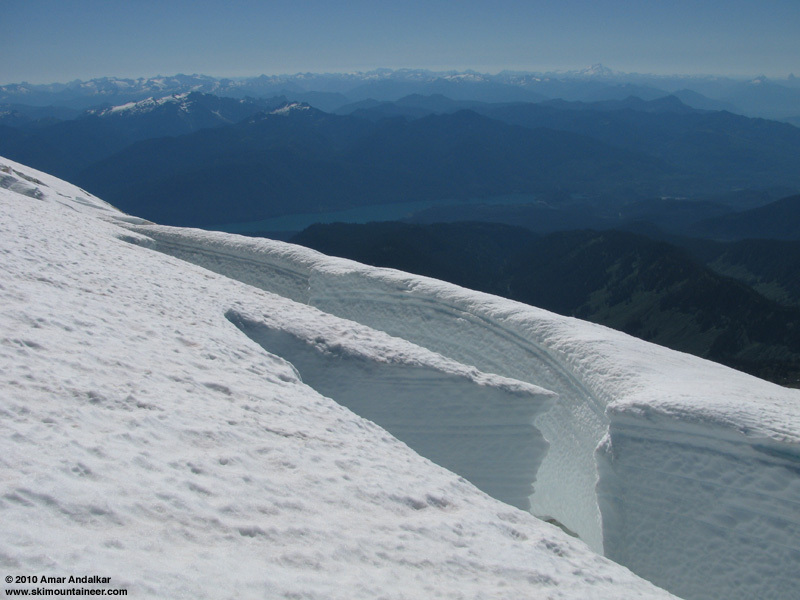 My fourth time up the Squak Glacier in 3 weeks, and snow conditions have actually IMPROVED since my last trip here 9 days earlier (August 6, Squak Glacier), especially below 7500 ft where the snow is much smoother now. The recent cloudy weather has flattened the suncups and runnels at lower elevations, just as I saw on the Paradise Glacier a few days earlier (August 11, Paradise Glacier). 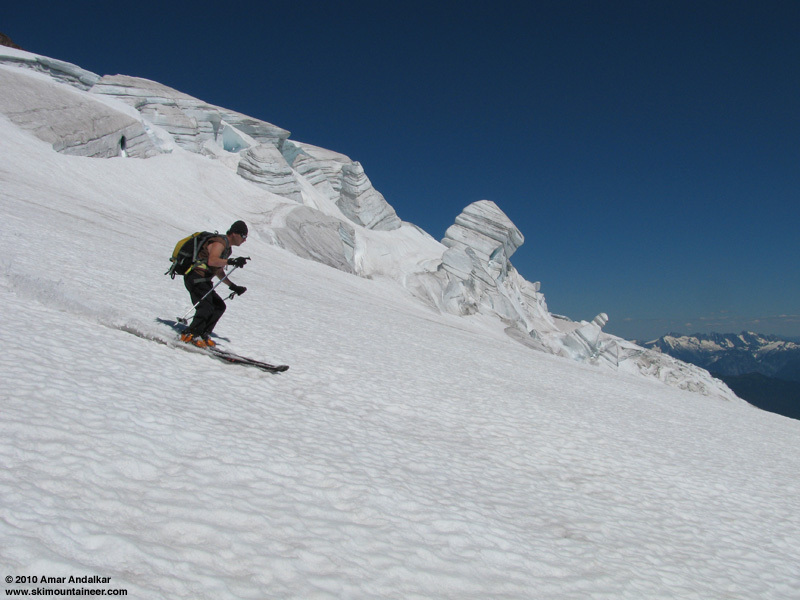 Carving corn past the seracs of Squak Glacier. Dave Coleman joined me this time, and after a nice bug-free car camp, we headed up from the trailhead just after 6am. Only a few bugs along the trail, plus most of the muddy sections have dried, and trail crews have removed all of the fallen trees during the past week too. Took the climbers path at the first moraine (about 3.5 miles) and after about a quarter-mile of moraine travel, were soon skinning up continuous snow from 5200 ft beside the creek in the drainage SW of Crag View, just after 8am. Surprisingly the snow had frozen fairly solid overnight even at this low elevation, despite the ongoing heat wave with the free-air freezing level hovering near 15000 ft. A testament to the power of radiational cooling on a very clear night, acting on well-consolidated summer snow -- I've rarely if ever seen snow frozen down to 10000 ft below the freezing level! 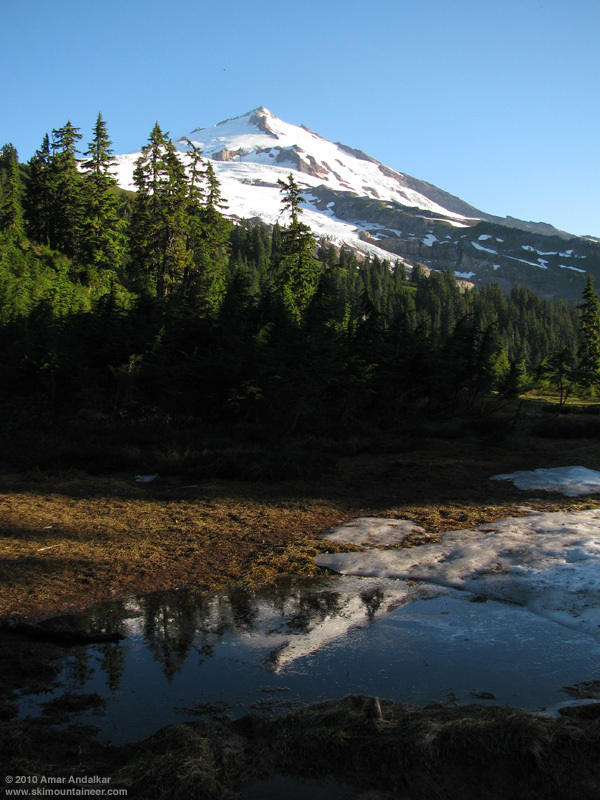 Sherman Peak and Squak Glacier, reflected in a puddle at the 4600 ft saddle. The firm snow, topped by a thin layer softening nicely in the morning sun, made for ideal fast skinning conditions, and progress was quick up the moraine basin and onto the Squak, maintaining about 1500-1700 vert per hour. As we approached 9000 ft, we angled well left to end-run the former crux crevasse, and this very safe route should remain passable for a few more weeks. As we skinned up past it, I headed over to take a look at the old crevasse crossing, and found that all of the bridges and passages across it had failed -- what I had skinned and skied across 9 days earlier now had a 2 ft long gap of open air. The gap in the old passage across the former crux crevasse. Crossing the bergschrund at 9400 ft, with Glacier Peak on the horizon. The bergschrund crossing at 9400 ft (where the Squak route joins the Easton route) still goes easily and safely too, as does the route up the Roman Wall which detours left to avoid cracks opening across former bootpacks. We brought a rope and glacier gear, but never needed it. Very easy skinning up the Roman Wall this time, I saw no evidence of a recent skin track, but putting in a new one was simple in a few inches of softened snow well-bonded to a firm base. We topped out on Grant Peak at 12:30pm, having seen two large climbing parties descending, but shockingly no other skiers yet. A 15-20 mph SE breeze kept things chilly atop the summit despite clear skies and glorious sunshine, but was easy to escape just below on the NW side of the knob. Enjoyed a nice long lunch break out of the wind. Carving soft corn on the upper Roman Wall. Skied down around 1:30pm, after another pair of skiers had finally joined us on top. Nice turns down the Roman Wall, staying on smooth snow west of the bootpack, oversoftened a bit but still carving like butter. The several inches of recent new snow up high has not fully consolidated yet, so it's more like spring snow conditions than summer up there. A few slightly sticky patches from 9000 down to 7500 ft, but mostly nice turns on smooth soft snow. And then, quite unexpectedly, it got really good -- smoother, firmer, faster, and less sticky below 7500 ft, perfect for carving big GS turns. I got overexcited and strayed left of our ascent route, suddenly skiing over a 3 ft wide open crack at high speed, gotta be more careful than that. Sweet smooth turns on the Squak. Nice turns all the way down the rest of the glacier and the moraine basin, with shallow suncups well-softened and easily carveable, reaching our hiking boots at 5200 ft around 2:20pm. 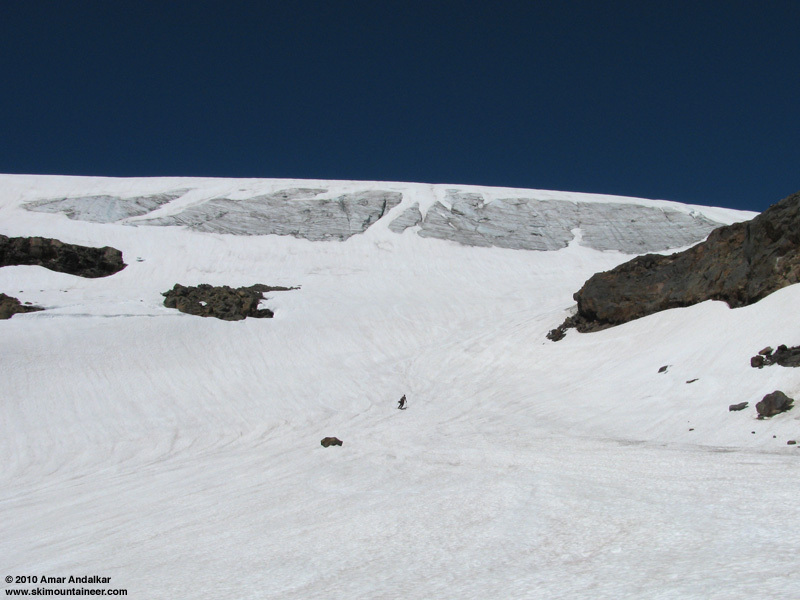 We did have to gently step our skis across a few feet of rocks near 5400 ft as the warm sun had melted away the morning's thin passage, the heat wave is quickly making the snow more discontinuous along the lower section of this route. Back to the trailhead just before 4pm, where a sudden onslaught of black flies sent us scurrying quickly into the car and on our way. Skiing the basin below the ice cliff near 6700 ft. 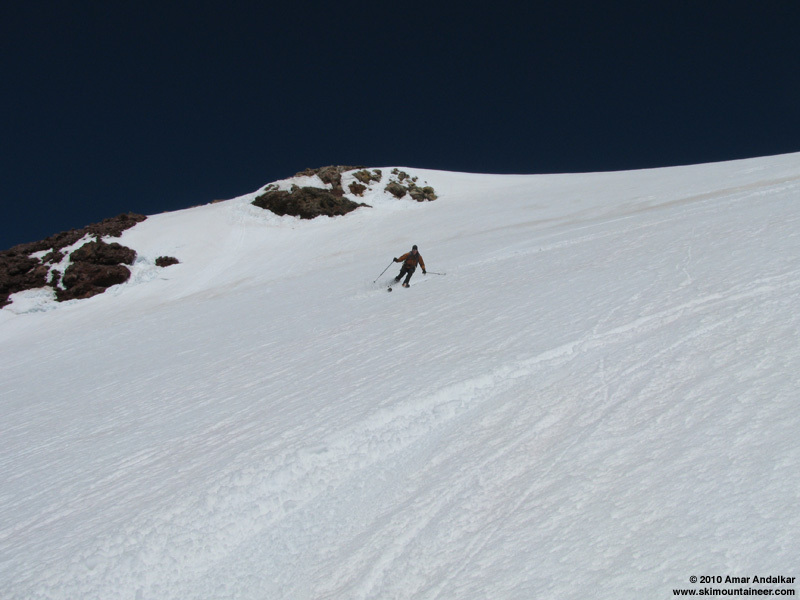 Skiing out via the moraine basin, near 6000 ft.
Another outstanding day on the Great White Watcher, still offering nearly 5600 vertical ft of excellent summer turns for 7500 ft of effort. 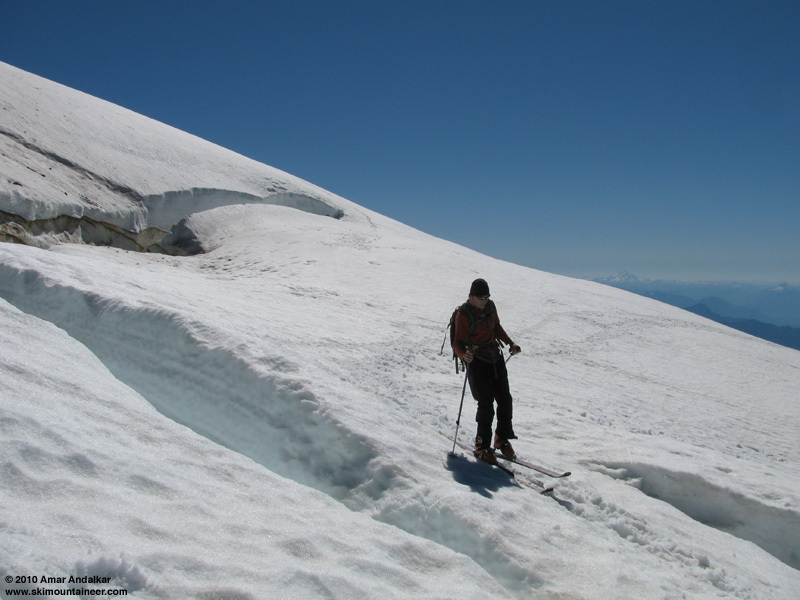 The Squak Glacier route remains in stellar shape, both in terms of crevasses and snow conditions, and it should ski nicely for a few more weeks at least. 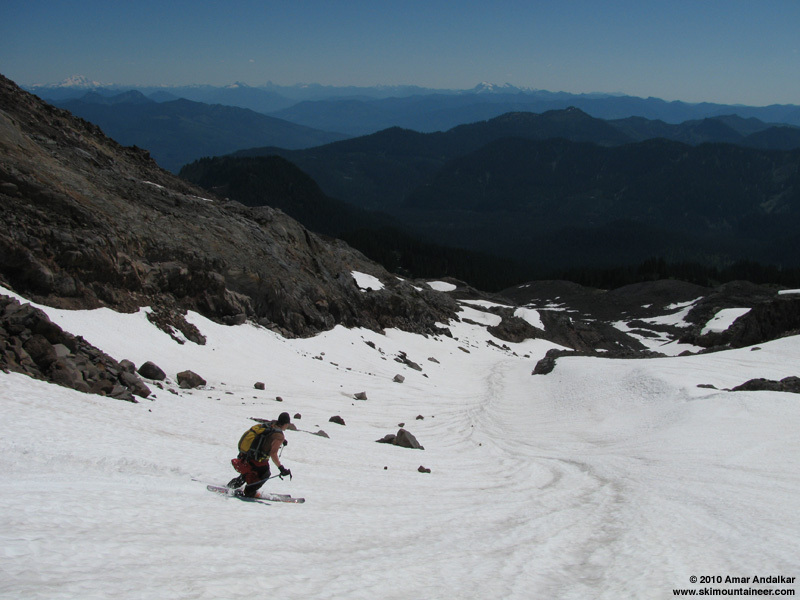 I think I'll be heading back up Mount Baker a few more times in August and September, certainly via the Squak and maybe also the Coleman-Deming or even the Easton routes for variety. If you give me some $$$$$ I will paint you your very own parking spot at the trail head. I'm sure a few people can vouch for my painting skills. In additional news today, Amar Andalkar will start a new website called SAY. Squak All Year. Not so fast, Amar will soon post a Paradise Gl report. Now if only the Park Headwall would consolidate...just in time as the forecasted change in weather, go figure.